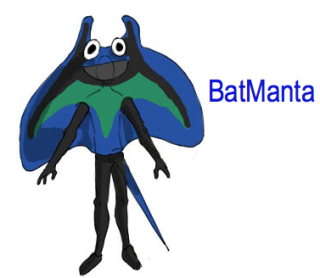 What animal looks like Batman, weighs more than a ton, can grow to 30 feet in width and is able to fly? 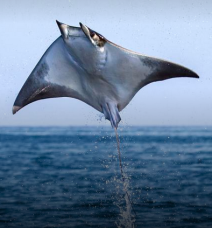 While it could be mistaken for a prehistoric bird, we’re talking about a manta ray (aka “flying mobula”). And they’re often captured on film bursting out of the ocean ascending as high 9 feet in the air. Traveling in shoals of hundreds — looking uncannily like Batman’s head gear and cape — mobile rays seem to have what it takes to achieve astonishing aerobatic displays that can propel them airborne for several seconds. Mobula rays’ elusive nature and skittish behavior in front of divers has made them difficult to observe in the wild, except when they breach the water. Mr Stewart explains that even large aggregations, like the one in the Gulf of California, can sometimes be hard to locate, as they seem to travel distances quickly, at alternating times of the year. “As far as we can tell, all mobulid rays jump, as do their myliobatid (eagle rays) cousins. Many theories have been suggested [as to why they jump], from feeding, courting, communicating, and ridding themselves of parasites,” Stewart says. Having studied film footage of the mobula in the Gulf of California, Stewart asserts that jumping is not gender-specific. Both males and females excel at breaching the water. Stewart is now planning to expand his research to confirm the reasons behind the aggregating behavior in the Gulf of California. His team will also be looking at how much of the population is represented, as well as further work on seasonal locations and habitat use. So stay tuned for further developments. And who knows . . . perhaps these Batman-like super fish might be featured in their own animated film series, in the not so distant future. 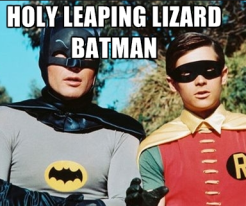 Batman, better watch his back! They Wouldn't Be Extinct If They Had Trained This Hard -- The Animal Video Of The Day!!! It May Be Time To Get A New Guard Dog -- The Animal Video Of The Day!! !